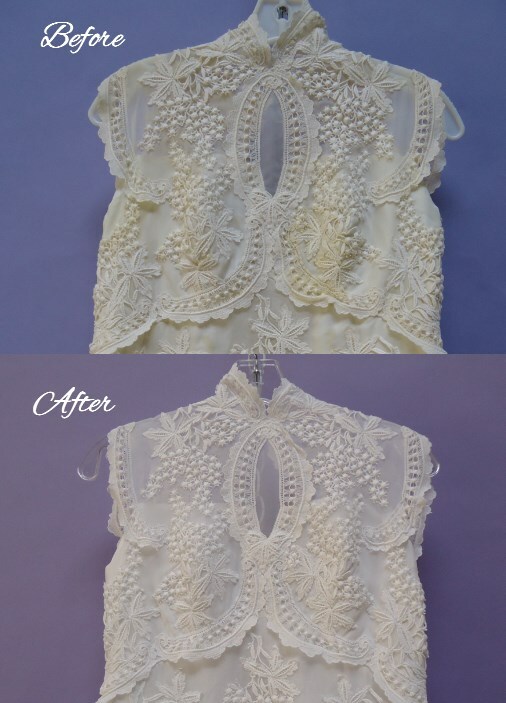 When Ann Meuel bought her wedding gown, she was not planning on needing a wedding gown restoration. She was looking forward to her wedding day. After the wedding, her dress was put away with new things to plan and do. But her dress was still a treasured garment, which she never imagined would turn as yellow as it did. 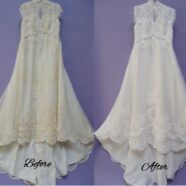 She sent brought it into our shop where are team of wedding gown restoration experts gave it a thorough restoration. 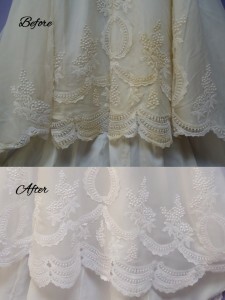 Ann’s wedding gown had yellowed and had several oxidized stains on the gown and veil. Luckily we were able to whiten her gown and spot clean the veil. Ann’s Museum Method™ wedding gown restoration and preservation allows her to continue to admire her wedding dress, while still protecting it for the future.